The idea that the teeth function in fighting is not supported however by the fact that the teeth are brittle and easily broken, and only shallowly rooted in the socket and unsuited for withstanding large leverage forces (Macdonald 1993, Macdonald et al. 1993). Furthermore, fighting male babirusas don’t use their upper canines at all, rather they stand bipedally and ‘box’ and prance round each other, each animal trying to impale the other on its lower canines. Clayton (2003) reported that one combatant may be lifted clear of the ground during one of these fights, and that severe wounds may be inflicted on the neck of the lifted individual. It presently appears most likely that the upper canines function in sexual display, though I don’t know of any studies testing this empirically [adjacent head shot is from Lynn Clayton’s Babirusa.Org site]. The bipedal ‘boxing’ behaviour of babirusas is odd, but arguably odder is a unique sort of ‘ploughing’ behaviour they have recently been shown to practise. On being presented with an area of soft sand, captive babirusas (mostly males) have been noted to kneel down and push their head and chest forward through the sand, the result being a deep furrow. 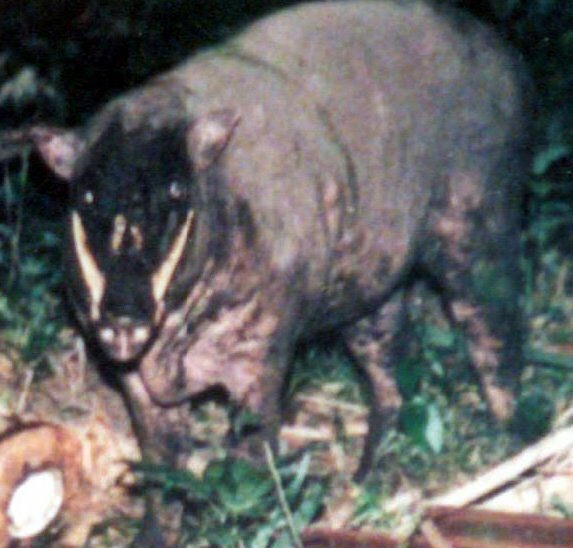 One obscure report from the 1970s suggests that Sulawesi people associated babirusas with the creation of straight-line furrows, and in 2002 possible babirusa furrows were reported from south-eastern Sulawesi, but this behaviour has otherwise gone unreported from the wild, and was first documented among captive individuals during the 1990s. After studying babirusas kept at the Royal Zoological Society of Antwerp, Leus et al. (1996) found that males performed the behaviour most vigorously when placed in the enclosure of another male, and as they ploughed they made various snorting and growling noises, and produced lots of foamy saliva. The animals were also seen to ‘mouth’ sand, the implication being that they were testing it for sensory clues left behind by other babirusas. Ploughing behaviour almost certainly, therefore, has a scent-marking function (analysis of babirusa saliva does not reveal the presence of sexual pheromones, as is the case in wild boar, but an unknown substance suggested to serve this role was discovered). A viscous fluid discharged from an orifice near the eye is also known to be produced by babirusas, and while it again likely functions in sexual behaviour its exact function remains mysterious (Leus et al. 1996). Ploughing behaviour is apparently unique to babirusas among Suidae, and its discovery implies that babirusas in captivity might have their behaviour enriched if they are provided with suitable areas of soft, plougable sand or soil. Observant readers will have noticed that, strangely, I’ve refrained thus far from using a scientific binomial for babirusas, plus I’ve consistently (I think) referred to them in the plural, and not as a single species. What gives? Well, the proverbial cat is already out of the bag, but the traditional taxonomy of referring all babirusas to the single species Babyrousa babyrussa is now defunct and there are good reasons for recognising several species. Babirusa taxonomy was reviewed by Groves (1980) who recognised four subspecies, one of which (B. babyrussa bolabatuensis from south-eastern Sulawesi) was named for Holocene fossils and apparently extinct. A fifth subspecies, B. babyrussa beruensis, is larger than the more recent forms and known only from Pleistocene fossils. irresponsible) situation’ (Oliver 2001, p. 4). -- B. babyrussa Linnaeus, 1758: a small species, with long, thick body hair and a well developed tail tuft. 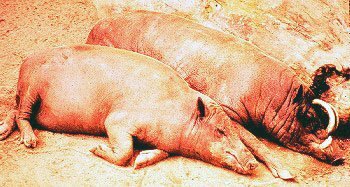 The common names Golden babirusa and Hairy babirusa have been used lately for this species. The upper canines of males are short and slender and cross the lower canines in lateral view. The upper canines tend to diverge or be subparallel, but they may be weakly convergent. B. babyrussa is from the Sula Islands (east of central Sulawesi) and Buru (just south-east of the Sula Islands). Most workers think that the babirusas were introduced to these islands, and if this is so we don’t know what their true place of origin was. Unfortunately babirusas from the adjacent eastern and south-eastern parts of Sulawesi remain unknown, so it is not possible to test whether or not they are particularly similar to B. babyrussa. -- B. togeanensis Sody, 1949: the largest species, it has sparser, shorter body than B. babyrussa and, in contrast to B. celebensis, the tail tuft is well developed. The upper canines of males are this species’ most distinctive feature: they are short, slender, rotated forwards and always converge. It is endemic to the Togian (or Togean) Islands, an island group that has been separated from the adjacent eastern arm of Sulawesi for c. 12,000 years. This suggests that the babirusas from the eastern arm of Sulawesi should be closely related to the Togian animals, but an absence of specimens makes this impossible to test (Meijaard & Groves 2002b). It cannot be ruled out that Togian babirusas were introduced to the Togian Islands by people. 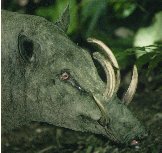 The adjacent photo of a Togian babirusa, taken in 1997 by M. Akbar on Malenge Island, is reproduced from Meijaard & Groves (2002b). -- B. celebensis Deninger, 1909: this is the babirusa we are all familiar with (see adjacent image of male and female). It has sparse or absent body hair, a nearly hairless tail tuft, and long, relatively thick upper canines that emerge vertically, converge slightly and curl dorsally in a circle. B. celebensis is the only species kept in captivity (so well done Filipe, this is the specific identity of the animal I keep going to see at Marwell: see How big is a white rhino?). B. celebensis is the commonest babirusa and the only one for which widely available photos are available. B. celebensis is only definitely known from the northern arm of Sulawesi. 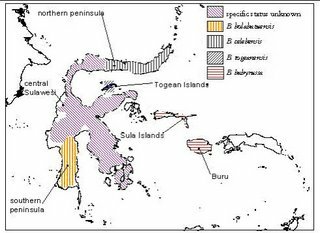 On mainland Sulawesi, babirusas are certainly not restricted to the northern arm: historically they occurred across the island, and those of central Sulawesi at least are still extant. Unfortunately their specific status remains uncertain as not enough data is known – while populations might be continuous with B. celebensis and hence referable to that species, a skull from near Kulawi in central Sulawesi differs from other babirusas in being particularly small, in having proportionally long lower premolars, and in various cranial proportions. Meijaard & Groves (2002b) thought that the skull had its strongest affinities with Togian babirusas, and they concluded that it probably represented another taxon. More data is needed to confirm this. A babirusa skull photographed on sale in south-central Sulawesi has also proved enigmatic, being quite different from the Kulawi skull and unidentifiable based on the data available (Meijaard 2003). Babirusas are also known from southern Sulawesi. Wiles & Mustari (2002) reported a skull, a tooth, and some eyewitness accounts of live animals from south-east Sulawesi, but in south-west Sulawesi babiruas are extinct so far as we know (though this needs confirmation). Hooijer (1950) named B. bolabatuensis (though originally as a subspecies of B. babyrussa) for teeth from the south-western arm of Sulawesi, though it has most recently been concluded that the material from this region cannot be reliably identified taxonomically (Meijaard & Groves 2002b). The Kulawi skull has at times been suggested to represent a modern example of B. bolabatuensis. The adjacent map, showing the distribution of the different babirusa taxa, is from Meijaard & Groves (2002b). What with the taxonomically indeterminate babirusas of central Sulawesi, the unconfirmed extinction of those of southern Sulawesi, and the rumoured presence of babirusas on various small islands around Sulawesi, they are a ripe area for discovery and further research. Reports, photos and specimens are badly needed from these regions, and we have some way to go before babirusa diversity and biogeography is properly understood. ‘Biodiversity of large mammals is severely underestimated. The existence of a narrow hybrid zone among large mammals can be detected in casual field surveys, which is not the case for small mammals and other animals that have to be trapped for close investigation. This simple fact has led to the downgrading of perfectly distinct, diagnosable species to a level where they become taxonomically ‘invisible’ and thus lost to biodiversity studies. There are many examples of large mammal genera in which single species are currently supposed to extend through forest and savannah zones (as in the elephant case treated here), and this series of case studies might be a place to start testing the proposition that their biodiversity has been underestimated’ (p. 3). Besides African elephants, this sort of taxonomic lumping has recently been asserted for giraffes (see Giraffes: set for change), the Potamochoerus bushpigs and river hogs (Grubb 1993, Groves 2000), the wild pigs of the Philippines (Oliver 1995, Groves 1997), warthogs (Grubb 1993, Randi et al. 2002), the African buffaloes traditionally all placed together in Syncerus caffer (Grubb 1972, Groves 2000), the bushbucks traditionally grouped together as Tragelaphus scriptus (Grubb 1985, Groves 2000), the red deer and wapiti traditionally grouped together as Cervus elephus (Geist 1999), gorillas (Groves 1996, Sarmiento & Butynski 1996, Sarmiento & Oates 2000), orangutans (Xu & Arnason 1996) and others. As I mentioned in the giraffe post, while Victorian zoologists were in the habit of naming multiple large mammal species, it was mostly 20th century workers who decided to arbitrarily lump these multiple forms together. As I’ve tried to explain before (go here), while biologists tend to be harshly critical of workers who erect new taxa based on only small apparent differences (such workers become known as ‘splitters’), there is far less criticism of those who indulge in laissez-faire lumping: it’s almost as if the lumpers are regarded as those ones who have the most realistic handle on species-level biodiversity. But do they? Well, as African elephants and the various other examples cited above indicate, no they don’t in all cases and we should be as sceptical of lumping as we are of splitting. Finally for now, if anyone knows of any employment opportunities that would suit me, please let me know. Seriously. For the latest news on Tetrapod Zoology do go here. Clayton, L. 2003. Tusk master. BBC Wildlife 21 (1), 52-57. Geist, V. 1999. Deer of the World. Swan Hill Press, Shrewsbury. Groves, C. P. 1980. Notes on the systematics of Babyrousa (Artiodactyla, Suidae). Zoologische Mededelingen 55, 29-46. - . 1996. Do we need to update the taxonomy of gorillas? Gorilla Journal 12, 3-4. - . 1997. Taxonomy of wild pigs (Sus) of the Philippines. Zoological Journal of the Linnean Society 120, 163-191. - . 2000. What are the elephants of west Africa? Elephant 2, 7-8. - . 2001. 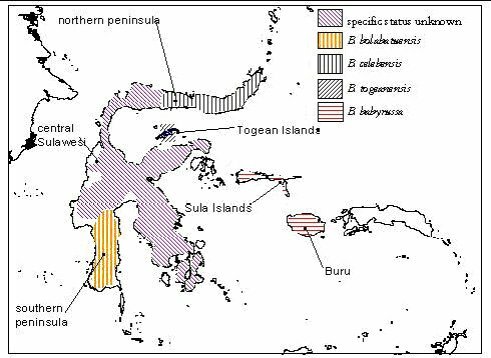 Mammals in Sulawesi: where did they come from and when, and what happened to them when they got there? In Metcalfe, I., Smith, J. M. B., Morwood, M. & Davidson, I. (eds) Faunal and Floral Migration and Evolution in SE Asia-Australia. A. A. Balkema Publishers (Lisse, The Netherlands), pp. 333-342. - . & Grubb, P. 1993. The Eurasian suids Sus and Babyrousa. In Oliver, W. L. R. (ed) Pigs, Peccaries and Hippos Status Survey and Action Plan. IUCN/SSC Pigs and Peccaries Specialist Group & IUCN/SSC Hippos Specialist Group (Gland, Switzerland), pp. 107-111. Grubb, P. 1972. Variation and incipient speciation in the African buffalo. Zeitschrift für Säugetierkunde 37, 121-144. Vertebrates: Systematics, Phylogeny and Evolutionary Ecology. Zoologisches Forchungsinstitut und Museum Alexander Koenig (Bonn), pp. 11-27. - . 1993. The Afrotropical suids: Potamochoerus, Hylochoerus and Phacochoerus. In Oliver, W. L. R. (ed) Pigs, Peccaries and Hippos Status Survey and Action Plan. IUCN/SSC Pigs and Peccaries Specialist Group & IUCN/SSC Hippos Specialist Group (Gland, Switzerland), pp. 66-75. - ., Groves, C. P., Dudley, J. P. & Shoshani, J. 2000. Living African elephants belong to two species: Loxodonta africana (Blumencah, 1797) and Loxodonta cyclotis (Matschie, 1900). Elephant 2, 1-4. Hooijer, D. A. 1950. Man and other mammals from Toalian sites in south-western Celebes. Verhandelingen der Koninklijke Nederlandsche Akademie van Wetenschappen, Afd. Natuurkunde. Tweede sectie 46, 7-164. Leus, K., Bland, K. P., Dhondt, A. A. & Macdonald, A. A. 1996. Ploughing behaviour of Babyrousa babyrussa (Suidae, Mammalia) suggests a scent-marking function. Journal of Zoology 238, 209-219. Macdonald, A. A. 1993. The babirusa (Babyrousa babyrussa). In Oliver, W. L. R. (ed) Pigs, Peccaries and Hippos Status Survey and Action Plan. IUCN/SSC Pigs and Peccaries Specialist Group & IUCN/SSC Hippos Specialist Group (Gland, Switzerland), pp. 161-171. - ., Bowles, D., Bell, J. & Leus, K. 1993. Agonistic behaviour in captive Babirusa (Babyrousa babyrussa). Mammalian Biology 58, 18-30. MacKinnon, J. 1981. The structure and function of the tusks of babirusa. Mammal Review 11, 37-40. Meijaard, E. 2003. Note on a photo of two babirusa skulls from Rante-pao, south-central Sulawesi. Asian Wild Pig News 3 (1),12. - . & Groves, C. 2002a. Proposal for taxonomic changes within the genus Babyrousa. Asian Wild Pig News 2 (1), 9-10. - . & Groves, C. 2002b. Upgrading three subspecies of babirusa (Babyrousa sp.) to full species level. Asian Wild Pig News 2 (2), 33-39. Oliver, W. L. R. 1995. The taxonomy, distribution and status of Philippine wild pigs. Ibex J.M.E. 3, 26-32. Randi, E., d’Huart, J. P., Lucchini, V. & Aman, R. 2002. Evidence of two genetically deeply divergent species of warthog Phacochoerus africanus and P. aethiopicus (Artiodactyla: Suiformes) in East Africa. Mammalian Biology 67, 91-96. Sarmiento, E. & Butynski, T. 1996. Present problems in gorilla taxonomy. Gorilla Journal 12, 5-7. - . & Oates, J. F. 2000. The Cross River gorillas: a distinct subspecies, Gorilla gorilla diehli Matschie 1904. American Museum Novitates 3304, 1-55. Wiles, R. & Mustari, I. A. H. 2002. Records of babirusa and warty pigs in SE Sulawesi. Asian Wild Pig News 2 (2), 31-32. Xu, X. & Arnason, U. 1996. The mitochondrial DNA molecule of Sumatran orangutan and a molecular proposal for two (Bornean and Sumatran) species of orangutan. Journal of Molecular Evolution 43, 431-437. What's the record for spliters? I remember something like ten or eleven synonyms for bison. 77 species of grizzly bear, AFAIK. Hi, I just accidentally discovered this site, and am totally enthralled with it. I plan on spending a lot of time reading it, having always been interested in fossil vertebrates and their evolution. In fairness, it should be mentioned that Groves - the person largely resposible for this and numerous other of these recent splits - is a strong believer of the phylogenetic species concept (in which subspecies essentially cease to exist) - to the extend that he has published papers (e.g. in Evolutionary Anthropology 10, 2001) solely dealing with why he believes this is better than the "traditional" biological species concept. When applied to one group, this can, as has been seen in a number of cases (notably among primates), be multiplied easily (two members of group X split on basis of the phylogenetic species concept; two members of group Y found to differ as much as the two members of group X, i.e. they must also be differnt species). In most - but of course not all - branches of biology, the biological species concept is (still) the preferred system. It is therefore of some importance that people know that several of the recent splits proposed by Groves et al. (and that includes the babirusa splits) are based on the phylogenetic species concept. Consequently, the case for several of these splits may not be as clear-cut as some have suggested (and cranial differences, while they may sound particularly impressive, are found among human "races", too, and I doubt any sane person would claim that e.g. white and black people were different species). Several phylogenetic species of babirusas - certainly. Several biological species of babirusas - perhaps. How big is a white rhino?